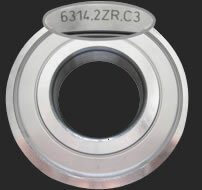 The quickest way to determine which bearing you require is using the bearings reference number. 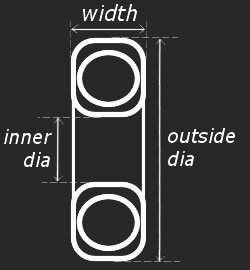 Most bearings have their references numbers engraved on the bearings themselves, but these often rub off over time and so it may be necessary to measure the bearing yourself, as described below. It is sometimes necessary to measure bearings to determine the correct bearing type. You can measure the dimensions of a bearing by using a vernier caliper like the one below or measuring accurately with a ruler. All bearings will have a width, an inner diameter and an outside diameter. Once you have determined the dimensions of your bearing, you can use our bearing search tool to find the correct bearing. There are three main types of bearing - roller bearings, ball bearings and needle bearings. The differences between these bearings are detailed below. Once you measured your bearing, you can use our search to find the correct bearing size. Additionally, bearings also have a clearance value. This provides the bearing room for expansion between the bearing races and will add a small amount of play between the two rings. An example of where a larger clearance is required is if a bearing is likely to get hot. The heat needs room to escape otherwise there is a risk of bearing failure. Ball Bearing - A ball bearing uses loose balls to maintain separation between the two races.